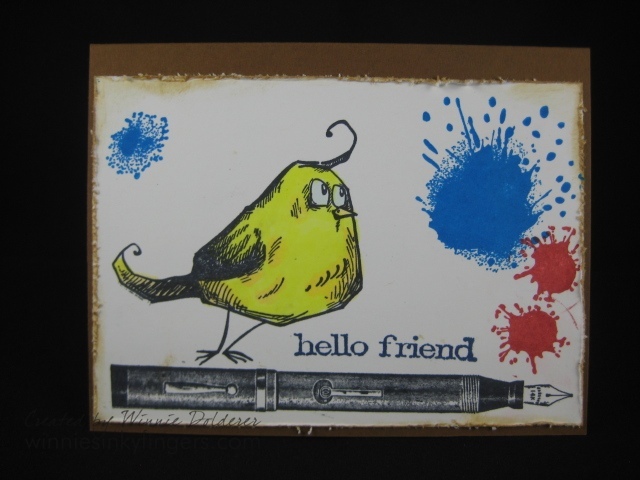 Winnie's Inky Fingers: Reclaiming My Card Making Joy Using a Crazy Bird! Reclaiming My Card Making Joy Using a Crazy Bird! This summer I have been on the go a lot and haven't had time to blog or even create many cards. I have missed it and hope things are settling down to where I can get back into the swing of things. Summertime is NOT my favorite season as I don't fare well in the heat, and after a long day of work and commuting I just don't feel like creating. I thought I would share a pair of cards with you today. The first one I made for a fellow fountain pen lover who is celebrating a birthday. I used one of the Crazy Birds stamps by Tim Holtz as I think they are just so adorable and happy in feel. Decided to perch him on a fountain pen, of course! The next card up I made for an upcoming birthday for a dear friend. I decided to use some fountain pen ink that I received from my favorite online fountain pen shop Goulet Pens. Sitting down to make cards again has really lifted my spirits and reminded me of all the joy this hobby brings into my life. Hoping you have a fun-filled day! I'd been thinking about you, so decided to come visit. 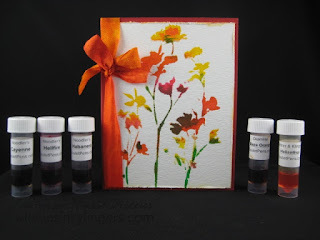 I LOVE the stunning stenciled card with the wild flowers in a warm color scheme. Stay cool and blessings, my dear friend! Cute cute cute...love the colors! The other card is wonderful too! So glad to see you back again and with 2 of the cutest cards! Love the Tim Holtz bird and the flower card is so beautiful. Great job on both of them. And flowers on the second are stunning! Hate summer! Cannot wait till fall and winter. My soul already there!